Being nearly Halloween, I thought I would make a witch cake. Sometimes it's great fun to play with food or be creative. I saw the cutest green witch fingers at the Dollar store. I thought they would look great surrounding a cake. They are actually suckers, so I cut off the sticks. Afterwards, I know I need something for the top of the cake. It looked too plain. Aha, an idea occurred to me. A witch stencil. I looked online and found a cute stencil. I found mine here. The printables are free, providing you like them on Facebook. I used green candy sparkles for the top. It goes with the green witch fingers. We had another dinner party and decided to make the brie more festive. I think it makes it pretty and festive for a fall table. Thank you for visiting. Enjoy your week! Hello Linda.....great cake....love the flying witch on top....such fun....Blessings Francine. Love your witch cake! The fingers are a great creepy touch. I love this cake!! I love witch themed stuff! I love your witch cake! So clever to use the witchy fingers! Just a wonderfully creative cake! I love that you thought to use the lollipops and cut off the sticks!!! Thanks for bringing this "finger lickin'" cake to ON THE MENU MONDAY!! It was finger licking good. That is very festive deserts! The witch fingers really complete the look ... love it "My Pretty"
The cake is super cute! Love the witch stenciled on top, and the fingers! And the brie looks very pretty with the cut-out leaf on top! Great ideas! 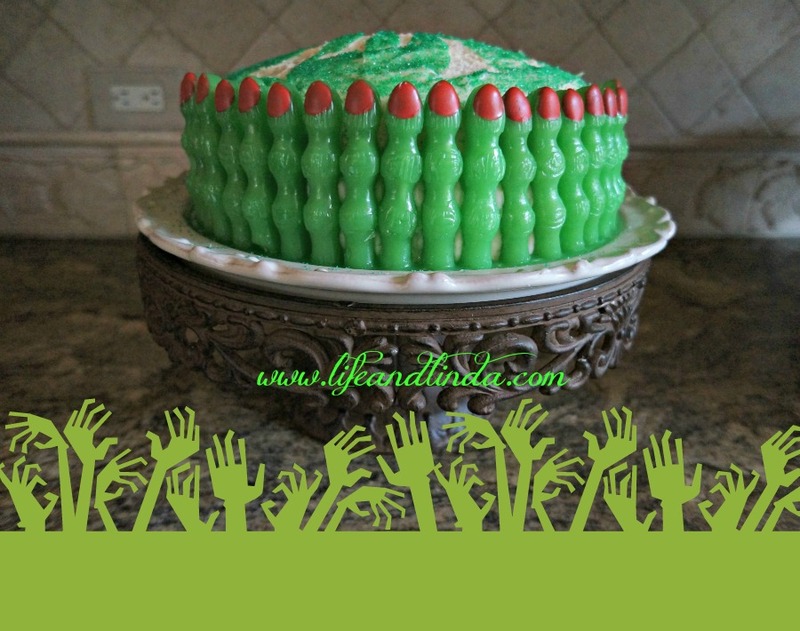 The stencil and green fingers are perfect for your Halloween cake! 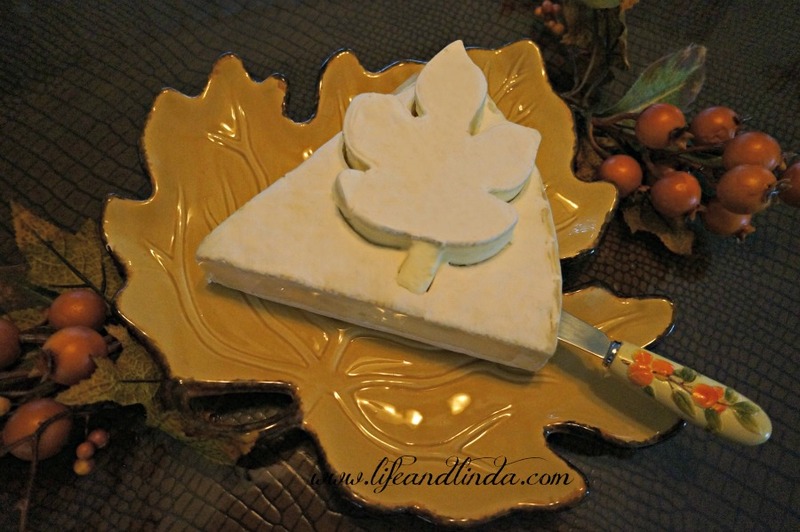 Everyone always enjoys Brie .. love the top with the cut-out leaf. Very creative! Love the green cake!! The stencil idea turned out awesome and those green fingers made it the coolest! 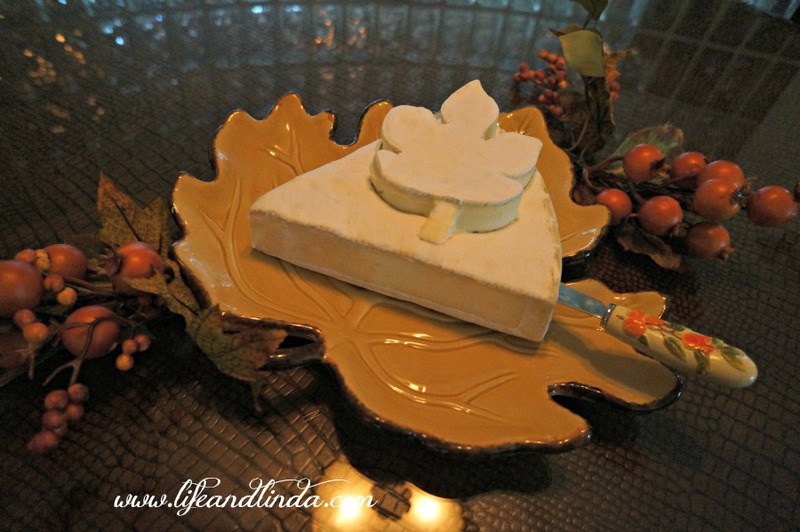 The brie looks great too- love the maple shape! You certainly know how to entertain don't you? From your tablescapes to your decorations to your food. Love the witches fingers around your cake and the leave on your brie. How creative, Linda! The Witch's cake is perfect especially with the fingers creeping up the sides. Beautiful! I'd love a piece of that cake! I really like your idea for the cheese, too! Love the way you put a personal touch to brie. I love brie but I would refrain from messing such a good looking piece ;). As always winner ideas from you. How inventive!! Can I have a piece it looks sooooo goooood!! Wow, that cake is incredible! So real looking :) I am now following you back. Your witch cake looks fabulous! Too pretty to actually eat. I love the border of witch fingers - so creative. What incredibly creative ideas. I'm more than impressed. Now if could only cook! What a great cake! Love the stencil idea. I'm stopping by from Fox Hollow! 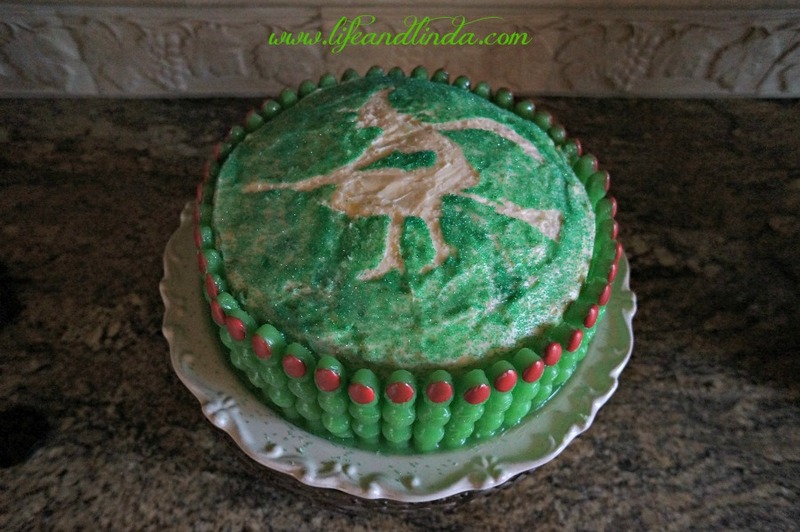 Your witch cake is so creative! Pinned! Cutest cake I've seen! Thanks for linking to What'd You Do This Weekend! I'm off to search for those suckers at lunch tomorrow.